Nathan Wolfe • Times Books, 2012, 305 pp. If you appreciate efficiency, you have to love viruses. A few genes, a few thousand “letters” of DNA or RNA, and they can conquer large, important organism like us. A virus not only can force its host to make more virus particles; it can also force the host to spread those particles. The rabies virus, for example, affects the brain, turning its host aggressive so it transmits the virus in slobbery bites. The influenza virus, which spreads in the coughs and sneezes it initiates, is again in the news, as scientists have finally been permitted to report what it might take for deadly bird flu to spread from person to person. Other viruses that have made headlines including the freaky bleeding virus Ebola and the human papilloma virus, which causes cervical cancer and started a political rhubarb after it was reported that Texas was requiring girls to be vaccinated as protection against cancer. Viruses may restrain cancer or attack bacteria, and they are the active ingredient in vaccines, which have been our key defense against viruses ever since 1796, when a British doctor tested a vaccine against smallpox, starting the conquest of the deadliest pathogen in history. 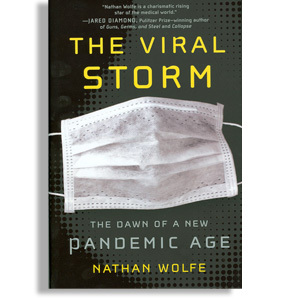 If you want to understand the fraught but fascinating world of the virus, take a ride with Nathan Wolfe. Young, bright, adventurous, he’s spent years tracking down viruses in the remotest corners of Africa. New viruses tend to come from animals, which make hunters a master link in the chain of infection. Wolfe has watched hunters expose themselves to blood and tissue while butchering their prey. With collaborators from California to Cameroon, he’s set up surveillance systems to monitor their blood and learn – early on – when the next counterpart of HIV or Ebola will “jump” to humans. Viruses, like bacteria and parasites, used to travel at the pace of a sailing vessel, but many of the human or animal hosts on a badly infected sailing ship, would be literally dead on arrival. That’s not ideal from the standpoint of spreading contagion. As SARS proved when it spread from China to Canada in 2003, jet planes now transfer pathogens before their human hosts even knew they are sick. The effort to detect and deter viruses has benefited from an explosion of knowledge – much of it stemming from the AIDS crisis of the 1980s – and the advent of gadgets like the “gene chip” that can automatically detect thousands of genetic sequences. Wolfe sketches out a brainstorm for a worldwide “control room” that would catch outbreaks in real time by monitoring “viral chatter” via a fire-hose of data produced by clinics, hospitals, cellphones and social networks. If you know much science or health, you’ll be able to skip some basic background, although I also could have used a bit more detail in some places: How does a virus infect a cell, and why is this sometimes so harmful? How, exactly, does a bushmeat hunter take apart a monkey? But if you want an introduction to the viral threat, together with some hints for surviving the next half century or so, here’s your next read.